Sixty-two dogs and cats were rescued from hurricane-stricken Puerto Rico this past weekend, according to Southwest Airlines. The Dallas-based airline completed a carefully planned relief flight that brought 14,000 pounds of humanitarian supplies to the island, and returned to Baltimore with 62 stray animals who were abandoned during Hurricane Maria. Organizations partner to fly abandoned dogs and cats from Puerto Rico to the D.C. area for adoption in the aftermath of Hurricane Maria. Image source: Southwest Airlines. 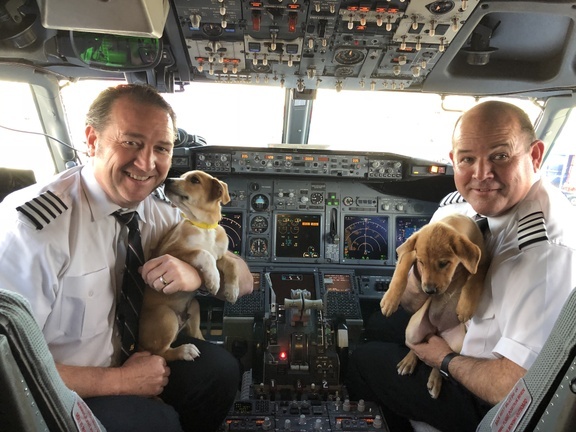 To make sure the journey went smoothly, a veterinarian and volunteers from Washington, D.C.-based Lucky Dog Animal Rescue were on board the 737 to monitor the four-legged passengers on the four-hour flight. Unfortunately, many animals were left behind by families who had no way of caring for them after the storm tore through the island. About one third of the dogs and cats have been adopted to families in the D.C. area. You can see the rest of the Puerto Rican rescues via the Lucky Dog website.